To work with if - elseif - else conditions in PHP. 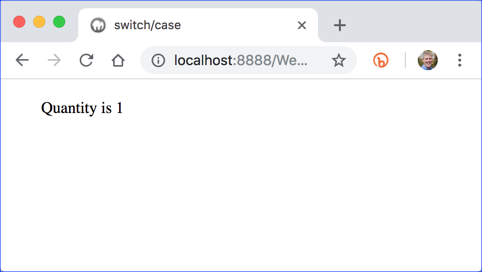 To work with switch / case statements in PHP. To use the ternary operator. To use the null coalescing operator. Conditional statements are used to determine whether or not to run a block of code or to decide which block of code to execute. The lines of code affected by the if condition are put in a code block, which is surrounded by curly brackets to indicate that all of the code either should or should not be executed depending on the true-false value of the expression. In the code above, either doThis(); or doThat(); will run depending on the true-false value of the expression. An if - elseif - else condition can have any number of elseif blocks, but only zero or one else blocks. Note the difference between == (equals) and === (identical). For two objects to be identical, they must be of the same value and the same type, whereas to be equal, they must only have the same value. For example, 1 is equal to, but not identical to, "1". It is almost always better to use the identical operator (===) and the corresponding not identical operator (!==) as these help avoid unanticipated errors. The file is relatively simple. You can see the different results by changing the value of $age and visiting http://localhost:8888/Webucator/php/Conditionals/Demos/if.php. More complex if statements often require that several conditions be checked. The table below shows and and or operators for checking multiple conditions and the not operator for negating a boolean value (i.e, turning true to false or vice versa). // This code will NOT run. NULL (a variable with no value). You will likely only need this function for testing purposes. 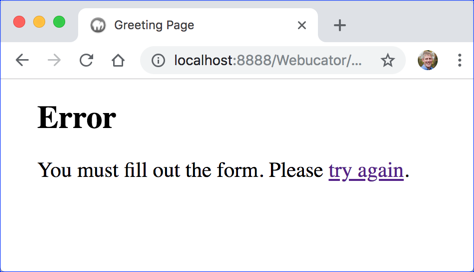 To see this in action, review Conditionals/Demos/testing-booleans.php in your editor and run http://localhost:8888/Webucator/php/Conditionals/Demos/testing-booleans.php in your browser. In some cases, you won't be sure whether a variable has been declared and/or whether it has a non-null value. PHP provides built-in functions for checking if a variable exists, checking if a variable holds a value, and removing a variable. To output the results of these functions to a browser, use the var_dump() function (e.g. var_dump(isset($a));). hello-hi.php?greeting=Hi: In this case, there is no difference. hello-hi.php: In this case, there is also no difference. 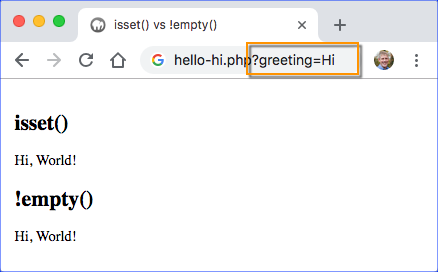 hello-hi.php?greeting=: In this case, there is a difference: $_GET['greeting'] is set, but it is not not empty (i.e., it is empty). For a complete list of variable functions see https://www.php.net/manual/en/ref.var.php. 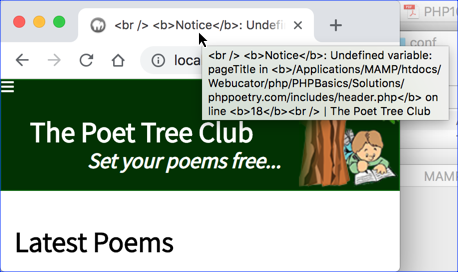 You will remember that we had an issue with the page title of our PHP Poetry site's home page: In this exercise, we will fix that issue. Open Conditionals/Exercises/phppoetry.com/includes/header.php in your editor. In the PHP block at the top, create a new variable called $pageTitleTag that will be used as the value of the <title> tag. Add code that checks for the existence of $pageTitle. If the $pageTitle variable exists, set $pageTitleTag to $pageTitle followed by ' | The Poet Tree Club'. If the $pageTitle variable does not exist, set $pageTitleTag to 'The Poet Tree Club'. Change the <title> tag, so that it just contains the value of $pageTitleTag. 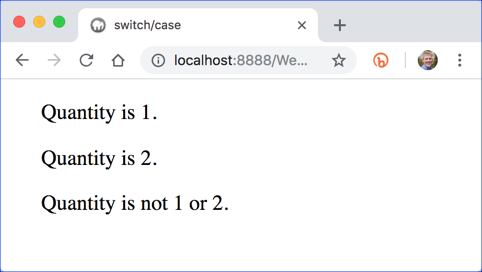 A switch/case statement is similar to an if statement, except that it can only check for an equality comparison of a single expression. It cannot, for example, be used to check if one value is higher than another. The break statement is important. Without it, after a single match is found, all following statements will execute. SuperAdmin will get all permissions. Admin will get update, create, and read permissions. Contributor will get create and read permissions. All others will only get read permissions. In conditional statements, it's good practice to test for the most likely cases/matches first so PHP can find the correct code to execute more quickly. In this exercise, you will create a page for handling a simple form submission. Open Conditionals/Exercises/greeting.html in your editor and review the code. This is the form that will be submitted. Filled out, it looks like this: This form is submitted using the get method, which means the form entries will be appended to the query string and will be accessible in the $_GET array. Open Conditionals/Exercises/greeting.php in your editor. 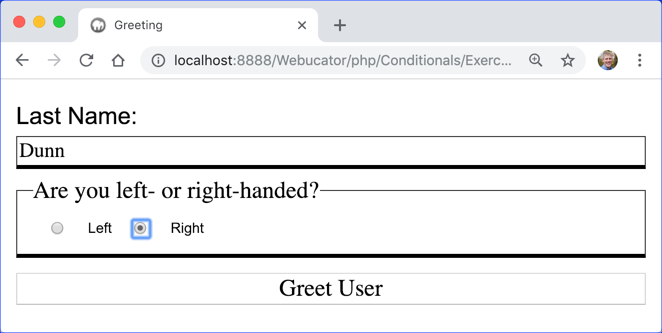 Insert a PHP block that checks to see if the user filled out both the last-name and the dominant-hand fields in the form. 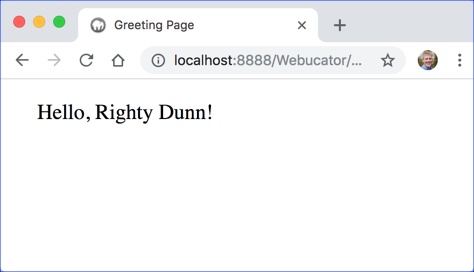 If the user filled out both fields, return an appropriate greeting such as "Hello, Lefty Dunn!" or "Hello, Righty Dunn!" 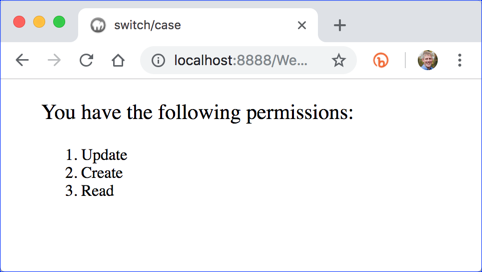 Try to use both an if condition and a switch statement in this exercise. Visit http://localhost:8888/Webucator/php/Conditionals/Exercises/greeting.html to test your solution in your browser. Submit the form with and without data. <p>You must fill out the form. If the expression is true, $varName will be assigned $valueIfTrue. Otherwise, it will be assigned $valueIfFalse. Open Conditionals/Demos/hello-hi-ternary.php in your editor to see this code in a file. In this exercise, you will modify the $pageTitle check in header.php to use the ternary operator instead of an if condition. Change the if condition that you wrote in the earlier exercise to use the ternary operator instead.